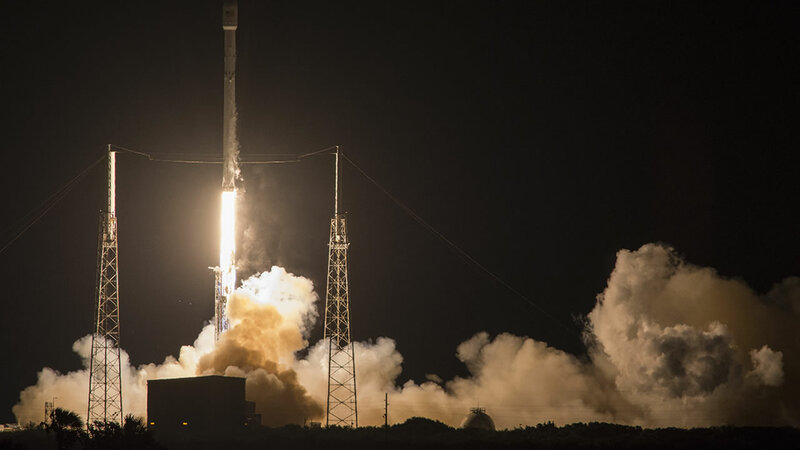 CAPE CANAVERAL, Fla. -- For the second month in a row, the aerospace upstart SpaceX landed a rocket on an ocean platform early Friday, this time following the successful launch of a Japanese communications satellite. A live web broadcast showed the first-stage booster touching down vertically in the pre-dawn darkness atop a barge in the Atlantic, just off the Florida coast. The same thing occurred April 8 during a space station supply run for NASA. That was the first successful landing at sea for SpaceX, which expects to start reusing its unmanned Falcon rockets as early as this summer to save money and lower costs. Because of the high altitude needed for this mission, SpaceX did not expect a successful landing. But it was wrong. As the launch commentator happily declared, "The Falcon has landed." SpaceX founder and chief executive Elon Musk was even more exuberant. "Woohoo!!" he exclaimed in bold letters via Twitter. "May need to increase size of rocket storage hangar," he added in a tweet. Musk said this was a three-engine burn for the booster's return, "so triple deceleration from the last flight." Before liftoff from Cape Canaveral, Florida, he put the chances of a successful touchdown at "maybe even" because the rocket was coming in faster and hotter than last time. Musk contends rocket reusability is key to shaving launch costs and making space more accessible. SpaceX is the only company to recover a rocket following an orbital launch. It achieved its first booster landing - on solid ground at Cape Canaveral Air Force Station - back in December. A landing at sea proved more elusive and required several tries. Blue Origin, led by another wealthy high-tech entrepreneur, Jeff Bezos of Amazon.com, has landed and even reflown its booster rockets, but those did not put anything into orbit. Following last month's landing, Musk said he plans to refly that booster, possibly as soon as June. The first recovered booster, from December, will grace the entrance of SpaceX headquarters in Hawthorne, California. Already in the delivery business for NASA, SpaceX hopes to start transporting U.S. astronauts to the International Space Station by the end of next year in the company's next-generation Dragon capsules. But its ultimate goal is Mars. In a groundbreaking announcement last week, Musk said his company will attempt to send a Red Dragon to Mars in 2018 - and actually land on the red planet. His ambition is to establish a human city on Mars. He also runs Tesla Motors, the electric car company.